Showers likely and possibly a thunderstorm this evening, then some lingering showers still possible overnight. Gusty winds and small hail are possible. Low 46F. SW winds shifting to NNW at 10 to 15 mph. Chance of rain 80%..
Showers likely and possibly a thunderstorm this evening, then some lingering showers still possible overnight. Gusty winds and small hail are possible. Low 46F. SW winds shifting to NNW at 10 to 15 mph. Chance of rain 80%. 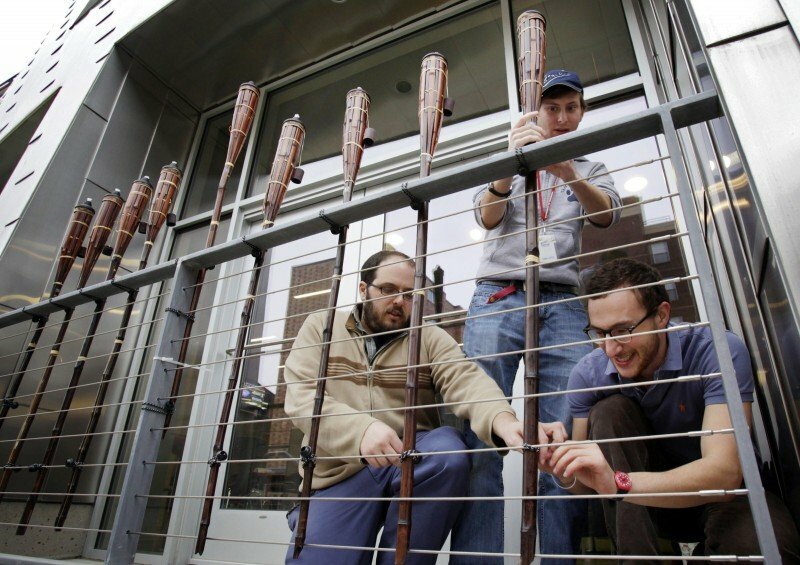 Josh Klemons, left, assistant director of UW-Hillel, and UW-Madison students Jeremy Hulkower and Benjamin Gluck, create a menorah — the traditional Hanukkah candelabra — out of tiki torches at the campus Jewish student center Thursday. The eight torches will be lit over the course of the eight nights of Hanukkah, beginning Saturday. Three new public Hannukah events this year are raising the holiday's profile in Madison. Rabbi Avremel Matusof demonstrates a historic olive press for children at the "Hanukkah Wonderland" event Sunday in Madison. 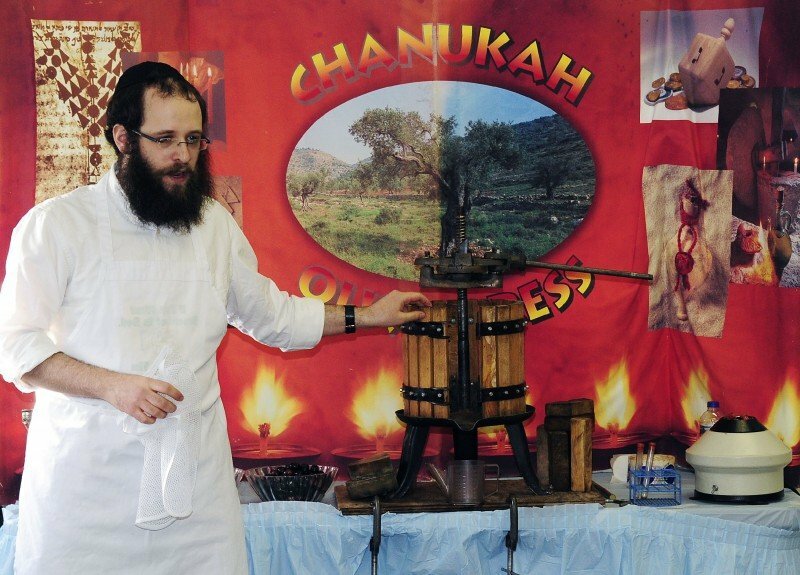 He spun the juice into olive oil, then used it to light a menorah. A menorah, fueled by olive oil, burns at the "Hanukkah Wonderland" event Sunday in Madison. The menorah is the centerpiece of the Jewish holiday, also called the Festival of Lights. Children play in a bouncy house, one of numerous activities for kids at the "Hanukkah Wonderland" event Sunday in Madison. A former auto glass garage was turned into a multi-station play area that included a dreidel tournament. One of the cherished children's books at the Robert Banks home in Fitchburg is "Happy Hanukkah, Curious George," which finds the beloved character spinning a dreidel and making latkes. In the book's fictional village, menorahs shine from every window, an image that delights the three Banks children but isn't replicated in what they see outside their house, said Banks, a teacher at Shabazz City High School in Madison. "They know there are other Jews in town, but they don't always see it," he said. "There's definitely that feeling of isolation here." As Banks spoke, his 4-year-old son, Seth, assembled an edible menorah — the traditional Hanukkah candelabra — out of cookie wafers and marshmallows, one of the numerous hands-on activities at last Sunday's "Hanukkah Wonderland" in Madison. The first-time children's event, sponsored by the Young Jewish Professionals group in Madison, was one of three new public events this year in Madison celebrating the eight-day Jewish holiday, which starts Saturday. There also will be a Hanukkah party at the Orpheum Theatre Saturday night and a Hanukkah car parade Thursday on State Street. The vehicles will be equipped with large menorahs on their roofs. Together, the events significantly raise the holiday's profile here. "It's a really big change for Madison," Banks said. Hanukkah celebrates an ancient military victory after which the Jewish people were able to miraculously light the temple menorah for eight days with a one-day supply of oil. That's why the holiday is called the Festival of Lights. Hanukkah participants light menorahs and often reflect on the importance of perseverance. While a very visible Jewish holiday, Hanukkah is not invested with the same religious significance as others, such as Rosh Hashana, Yom Kippur and Passover, said Jordan Rosenblum, an assistant professor of Hebrew and Semitic studies at UW-Madison. "That doesn't mean no one cares about it — all Jewish holidays are important — it's just that Hanukkah is never mentioned in Jewish scripture because it commemorates events after the Torah was written," he said. Consequently, Hanukkah is not associated with the same restrictions as other Jewish holidays, such as prohibitions on working and cooking, Rosenblum said. Hanukkah has gained popularity internationally as part of the Chabad-Lubavitch movement of Judaism, which emphasizes reaching out to non-practicing Jews, Rosenblum said. "That's why you're seeing more and more events like the menorah parades, which are a very new tradition," he said. Young Jewish Professionals, the group behind all three events, is partially sponsored by Chabad of Madison. "We're trying to cater to a Jewish crowd that's not involved," said Rabbi Avremel Matusof, director of the group. "We're trying to make some noise to bring them out of their holes." At the Hanukkah Wonderland Sunday, held in a former auto glass garage on Madison's Far West Side, dozens of children jumped around in a giant bouncy house, built Menorahs out of Legos and watched as Matusof made oil from an olive press. "Activities like these really bring public awareness to the Jewish community," said Alice Schneiderman of Madison, who brought her two children. "And these are great opportunities for Jews — whether affiliated with a temple or not — to come together, talk and schmooze,"
Michael Levin, 21, a UW-Madison senior, carried a sword and roamed the area in a tunic and helmet as Judah Maccabee, the acclaimed Jewish warrior behind the Hanukkah military victory. He recalled fondly how his family lit menorahs together. Occasionally, his parents would give him small Hanukkah gifts, such as Hot Wheels cars. "It was always a very special holiday, especially as a teenager," he said. "You're trying to figure out who you are and what's important in life, and here's this holiday that teaches you to be strong, even through oppression. It has always made me proud of my heritage." Hanukkah Social: An adult party Saturday from 8 to 12 p.m. at the Orpheum Theatre, 216 State St. A celebration featuring wine, cheese, sushi and Hanukkah treats, with professional wine steward Merrell Tomlin and Brazilian-born artist Jonatas Chimen, who will be showcasing his paintings. No tickets required. A donation of $10 at the door is suggested. Hanukkah Car Parade: More than 15 vehicles equipped with overhead menorahs will parade around Downtown Madison Thursday. The parade will begin at 5 p.m. at 1722 Regent St., then travel down West Washington Avenue to the Capitol. After circling the Capitol, the parade will head down State Street, then over to Langdon Street, ending at 223 W. Gilman St.